Back in 2016, 6sqft reported that the iconic “Pumpkin House,” a 1920s townhouse cantilevered from a cliff in Hudson Heights, had hit the market for the first time since 2011 for $5.25 million. Still without a buyer the following summer, the 17-foot-wide, six-bedroom brick home at 16 Chittenden Avenue received a price chop to $4.25 million. 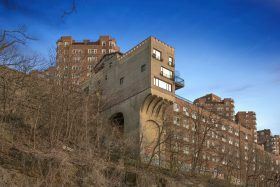 The unusual home—standing 250 feet above the Henry Hudson Parkway—finally found its new owner this Thursday, when it sold for a deeply discounted $2 million, as reported by the New York Post. You may be familiar with the “Pumpkin House,” the extraordinary 1920s townhouse cantilevered across the cliffs at 16 Chittenden Avenue near Manhattan’s highest point in Hudson Heights. The name comes from the home’s Jack-o’-lantern countenance, which bestows motorists along the George Washington Bridge with its anthropomorphic leer. Jack first hit the market last August for $5.25 million, the first time listed since 2011. But still without a buyer, the 17-foot-wide, six-bedroom brick home has a fancy new Sotheby’s listing and a lower ask of $4.25 million. So titled for its window pattern that resembles a jack-o’-lantern (especially when lit up at night), this funky home in Hudson Heights has long been a hot topic in the real estate scene thanks to its unusual location extending over a cliff near the highest point in Manhattan, just north of the George Washington Bridge. Built around 1925, the 17-foot-wide brick house was purchased in 2000 for $1.1 million by interior decorator William Spink. After doing a good deal of structural renovation, he listed it for $3.45 million in 2005, but after failing to sell, tried again in 2010 for $3.9 million. It sold the following year and is now back on the market asking $5.25 million.